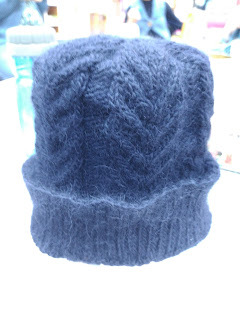 I finished this hat for Sib on the morning I had to give it to him. It really was the squishiest and most delicious knitted hat I think I have ever made. Pattern: Antler Toque by Tin Can Knits. Yarn: Suri Merino by Blue Sky Alpacas - just a bit more than a skein. Needle: 4mm and 4.5mm. I didn't swatch but had a thought after I started knitting the ribbing, looked up other projects on Ravelry and went down from a 5mm accordingly. Mods: None. I am afraid it was a bit too big - he said not, but the brim was turned a long way back. I might make it with one fewer cable repeat if I had a do-over. I've got a skein of maroon that I could use to make a similar hat for his girlfriend when she comes over from Peru next month. That might be nice. I reckon if I went with a smaller size/fewer repeats then I could get it out of one skein.